For more than ten years David Derigiotis has been involved in underwriting, account placement, and educating within the professional liability specialty segment. David’s technical underwriting expertise was developed through his time spent with two “A” rated international insurance carriers where he underwrote across multiple professional liability product lines. David currently occupies two roles within the Kaufman Financial Group, headquartered in Farmington Hills, MI. As a Vice President for the largest subsidiary Burns & Wilcox, David manages a team of brokers and underwriters exclusively focused on professional and executive liability risks and coverage solutions. David also serves as the Director of R.B. Jones, a sister company to Burns & Wilcox and specialty MGA focusing on professional liability, recreation, general liability, environmental, and the umbrella/excess product lines. David has appeared on the Fox Business Network and CNBC as a recognized cyber & privacy expert during the nationally televised Markets Now and Power Lunch programs. David is also a licensed continuing education instructor teaching courses on professional liability and cyber & privacy liability throughout the country for independent insurance agents and brokers. Some publications featuring David include The Wall Street Journal, National Underwriter, Advisen, and Rough Notes. David has been previously nominated for Detroit Crains Top 40 professionals under 40 and has held the prior role as a Senior Broker with Burns & Wilcox. 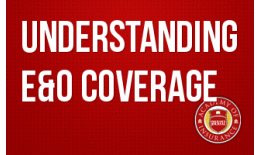 Join us for a breakdown of the E&O policy form and learn how to properly insure your client's exposures.